There is a change in tone and feel as Jesus arrives in Jerusalem fresh from the hopes and excitement of his teaching ministry in Galilee. The mood becomes increasingly confrontational. Jesus’ focus becomes one of avoiding the traps that are being set for him. In the atmosphere of religious and political extremes that characterized Jerusalem under the yoke of Roman occupation, there is small wiggle room between blasphemy on the one side, and treason on the other. It’s into this double-bind space that a particularly, unholy alliance of Herodian (the royal party of collaboration) and Pharisee (the religious part of religious reform) factions seek to lure Jesus. The question is: is it lawful to pay the poll tax (a flat-rate personal tax) to Rome? If Jesus answers yes, he commits blasphemy – admitting that Caesar is a rival authority to God. If his answer is no, he commits treason – denying the authority and what’s more the divinity of the Emporer. How will Jesus answer them? To answer yes, or no are both dangerous options. Yet, so too is any attempt to offer a middle way answer. As we know only too well from contemporary American political debate, when an atmosphere of fear and mutual contempt characterizes a separation of competing political and religious world views, a moderate view pleases no-one. One can only admire Jesus’ dexterity. With one question: whose, head is on the coin? he draws both interlocutors into the trap they think they are setting for him. I imagine it’s one of the Herodians who produces the coin. To possess such a coin within the Temple precincts is in itself an act of blasphemy. 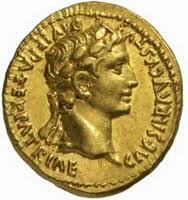 Caesar’s head, a forbidden graven image, appears on the coin. However, it’s the inscription that encircles the head of Caesar that proclaims him as divine that goes to the heart of the matter. Jesus’ next move is to state that some things are owed to civil authority and some things are owed to God. It appears simple, honor your obligation to each and don’t get them mixed up! Jesus answers by not really answering. His answer silences his opponents, but we are still left with the unanswered question: what does he really mean? The health of the American body politic rests upon several nice and neat separations connected with today’s Gospel reading. The most obvious is the separation of Church and State enshrined in the Constitution. We are mostly, in agreement that: render unto Caesar means an obligation to submit to the lawful exercise of civil authority. Therefore, although some of us question the right of the government to levy taxes, few of us refuse to pay them. We are less clear as to what: render unto God the things of God, means. Why might that be? Jesus, the Pharisees, and the Great Seal of the United States are all in agreement. 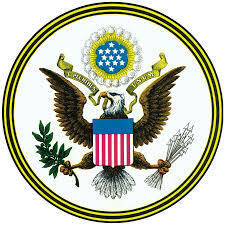 Each affirms the truth of the motto on the Great Seal: In God We Trust. It’s an interesting aside to note that from 1782 until 1956 the motto on the Great Seal was : E Pluaribus Unam -out of many, one. In 1957 it was changed to: In God We Trust. Interesting to speculate on the reason for the change. But best not go there at the moment. In other words, there is a legitimate distinction to be made between Church and State, but not between God and State. Yet here, as in most areas of our lives we play a subtle game of selective cognizance. There’s a nice story told about the Christian conversion of the Gauls. When the Christian missionaries led these Celtic warriors into the water for baptism, as the man was submerged under the water he raised his right arm up so that his arm and hand remained above the water. The intent here is clear. The warrior was saying: my sword arm and hand do not belong to God and with these I reserve the right to kill and maim. Whatever the historical veracity of this story it reflects a common view today. While we may be made in the image of God and therefore everything about us belongs to God, our money at best – belongs to us, and at worst – to the Government. As I like to put it, we live as if our hearts belong to God, but not our wallets. The heart of this Gospel encounter is not concerned with creating a clean separation between God and Mammon, or between civil and religious authority. The central issue concerns allegiance and ownership. To whom, or to what do we owe allegiance? Over which aspects of our life do we have a right to exercise ownership? The way we choose to answer these questions reveals the kind of persons we long to be, as well as the kind of community we envision ourselves becoming? At St Martin’s, Sunday October 19th is when we launch our Annual Renewal Campaign (ARC). The Church tells us that stewardship is more than what we do with our money. But we all have a sneaking suspicion that this is mere window dressing when the only time of the year we really address issues of stewardship is in preparation for setting the next year’s budget. You don’t need me to tell you that money matters. It matters because like every other aspect of our lives money goes to the heart of our spiritual values. Episcopalians often have an impoverished thinking about our financial pledge. We see it as giving to the parish budget. How unsexy is that? Neither is it very spiritually fulfilling! We have a need to expect that our financial generosity will bear richer fruit. Through our giving we long for fruit that leaves us with a sense of having made a difference, and not simply kept the lights on. So, let me reframe. Let me state that while stewardship is a year-long program of nurturing the life of our community, it commences with the conversation about our accountability before God in the area of financial responsibility. The Gospel we hear today invites us to see stewardship hinging upon the core issues of allegiance and ownership. While there is a practical connection between our ARC and next year’s budget, there is no spiritual connection between the two. This bears endlessly repeating! The main question is not how much do we need to give to meet next year’s budget? The question before us is to whom do we owe allegiance for everything that is good in our lives? Do we view the use of money in relation to our primary allegiance to God, or is money, in effect our Celtic warrior’s sword arm? Do we think our financial health and security are the fruit of our own achievement, or the grace-filled gift from God? Jesus’ confrontation with the Herodians and Pharisees challenges our comfortable assumption that our money is the product of our own skillfulness, our own good luck, or our privileged ability to command a nice financial reward? Jesus challenges us to think about our primary allegiances. He also invites us to an encounter with gratitude as our response to God for the good things we have been given to enjoy. On November 16th, our ARC concludes with Ingathering Sunday. This is also the date the Bishop comes to install me as St Martin’s 12th rector. Our theme between now and then is not how much do we need to give to next year budget. Our theme is celebrating our community’s rich human potential. We begin with an acknowledgement of gratitude to God for the many gifts, strengths, and qualities that already characterise our individual lives, and life together in our St Martin’s community. As we celebrate these things, I invite us to enter into an intentional conversation together about gratitude and generosity. In the coming week you will all receive a communication from me in the mail. In it I explain in more detail how we might go about structuring our conversation about gratitude and generosity. Who are the persons who fill our lives with a joy and quality of life that brings us to our knees, overwhelmed by a deep thankfulness to God? A variation on this question might be for some of us, who have the persons been that have filled our life with a quality that continues to overwhelm us with a deep thankfulness to God? What are the experiences, the events that have deeply shaped our lives, experience of grace and love given to us against all the odds of probability, that on contemplation bring us to our knees in thankfulness for the reckless generosity of God? Reconnecting with these places of personal encounter with the generosity towards God, can we risk to share our experience of gratitude, inviting others to open to a similar experience in their own lives? Jesus answers his opponents by implicating them in the tensions they seek to entrap him within. His answer silences them, but we are still left with the unanswered question: what does he really mean? It is never an easy task to negotiate our way in today’s world amidst the many siren calls that offer attractive, yet fruitless allegiances. Today’s Gospel challenges us to consider how we displace God from the center of our sense of allegiance. Thinking of ourselves as the source of the good we enjoy, seeing ourselves as the ultimate authority is the best definition I know of blasphemy. In my own life I note how an allegiance to fear, to power, or the complacency of success, continually tempt me. Jesus does not say that it is easy living in the tension between the things of Caesar, and the things of God. He simply warns us about the competing powers and influences vying to sway us, to capture our hearts, and ultimately to own us? When we displace God as the focus of our allegiance we render ourselves vulnerable. Under the illusion of owning ourselves, we become vulnerable to being owned by competing worldly allegiances. Jesus’ interlocutors in today’s Gospel go away amazed. I invite us to deepen our community’s financial stewardship conversation over the next weeks through a personal encounter with our experience of gratitude for God’s generosity. Who knows, maybe we too can become amazed by what we begin to glimpse ourselves being capable of. I don’t know when bifocal spectacles were invented? I do remember when I was young seeing people with two pairs of spectacles – one for short and one for long sighted purposes. You sometimes still see the older style of bifocals -you know, the ones with the clear line across the middle, separating short and long sighted lenses. Most of us who are able to tolerate the initial disorienting effect until our vision adjusts are thankful for the invention of varifocal lenses. Varifocals enable the wearer to move seamlessly from short to long sighted zones in what otherwise appears to the naked eye to be one undivided lens. I offer this as an analogy for reading scripture. This analogy is particularly useful in learning how to read the Gospels. The Gospels are the foundational narratives of the Christian Faith, in that they weave accounts of the earthly life and ministry of Jesus. From Gospel to Gospel, these accounts are similar, and yet quite different in emphasis. They spin the story of Jesus. I feel we need to rehabilitate the word spin. We tend to use it pejoratively today because we live in a world where mass means of communication bombard us with catch phrases and sound bites, which it seems are often designed to obscure rather than clarify truth. Yet, when it comes to story, there is no objective independent story telling. There is only the story as a construction of experience. Stories make sense of the complexity of our experience of the world. It is this process of constructing meaning, rather than obfuscation that I mean when I use the word spin. All stories contain spin, even our own life stories, as I explored in my entry – If to err is human- so too is to forgive. This is also true of all Scripture. We need a good pair of varifocal lenses, firmly planted across the bridge of our noses when we come to read the Gospel texts. Matthew 22:1-14 through the short-sight zone of our varifocals appears as a quite extraordinary tale. It assaults our sense of credulity at more than one point. In last week’s reflection- Might Jesus have been a Pharisee, I described the parable medium that Jesus used as his primary teaching tool as a story of the everyday life that suddenly whacks you in the side of the head. Today’s parable of the royal wedding feast not only whacks us in the side of the head, it delivers a punch or two to the gut. It’s a story about a King who invites people to the wedding of his son. When he finds out that his selected guests have not only declined his invitation but they have killed the servants bearing the invitation. He retaliates by sending out the militia and not only killing them all, but devastating their city, as well. Now it’s not lost on us that the king is clearly a representation for God. So it’s particularly difficult for us when we read that God behaves vindictively to such devastating effect – whack! The King then sends his servants out to invite anyyone they encounter in the streets, regardless of their station in life or the morality of their lives. Aahh, we sign in relief, as God seems to have recovered and is acting back in character. For over the last few weeks in the parables of the vineyard we have been presented with images of God as a reckless practitioner of generosity. All seems well. The wedding hall is full to over flowing and a beaming King makes his entry only to discover that one of the guests has gained entry without the seemingly required wedding garment – where did that requirement suddenly spring from? The King a.k.a, God seems to lose it again and has the man cast out of the feast and condemned to outer darkness – i.e. damnation – whack, whack, punch! In short sight this is not a story that inspires in us much confidence in being able to safely predict God’s behavior. After all, our feeling safe as a condition for being able to trust one another rests firmly on our being able to reasonably predict one another’s behavior. We get really nervous when someone starts acting unpredictably, God included. This leads me to the question: so is this parable helpful in any way? What on earth is Jesus’ point here? The moral of the story seems to be: be careful when refusing invitations, and if you do accept, make sure you have the right clothes for the party. As we lift our eyes towards the long-sight zone of our varifocals we begin to discern the outlines of a different story. To put it boldly, this original Jesus parable is being spun by Matthew for his own purposes. Matthew is telling a related, but quite different story from the one Jesus tells in the context of his confrontation with the Temple authorities. It’s related in that we can still discern Jesus’ teaching, but this core teaching of Jesus is overlaid with the events and concerns that are dominating the lives of Matthew and his community. Matthew’s story is that God invited his beloved Israel to his royal banquet, but Israel declined to come. Not only did Israel decline, but it acted violently towards God’s servants, a.k.a, the Hebrew Prophets, and ultimately towards the fulfillment of the prophets, Jesus himself. God punished Israel by sending the Roman Legions against Jersualem, killing and scattering its populace and laying waste to the great Temple. The Roman destruction of the Temple in 70 AD takes place a good 40 years after Jesus death. With hind-sight Matthew, writing around 90AD inserts this event into the original parable of Jesus with the line about the King’s retribution. This becomes clearer to us as we look at the text through our long-sight lens. In Matthew’s story the guests at the banquet are now the rag-tag collection of odds and sods, forced into a new community as a result of being outcast from their community of origin, i.e. the fledgling Jewish Christians who are now outcast from their synagogues. This new community needs to construct its own story to help it make sense of the new situation it finds itself in. Matthew, in continuity with Jewish tradition is their scribe. Like all scribes throughout Israel’s history, his job is to reinterpret the faith story in the light of current events. Matthew tacks onto the end of the parable about the royal wedding a quite separate story about the wedding garment. If this is original to Jesus, it must come from a completely different context and so its original meaning seems unclear. What Matthew intends it to mean however, is clear. Within this rag tag band of odds and sods, that is the emerging Church, while many differences must be tolerated, there are some fundamental standards that are to be enforced to ensue good order. The wedding garment is a metaphor for correct behavior. What might correct behavior mean in Matthew’s community? Correct behavior in any community is more than obeying the by-laws and reflecting the socially accepted norms. Correct behavior is behavior that strengthens the bonds of affection, friendship, relationship, and commonality. Maverick and unpredictable behavior that sows seeds of discord and corrodes trust in the members of a community’s ability to communicate effectively with one another is the equivalent of being found at the banquet without the right clothes. Matthew is saying, in his new and vulnerable community this kind of behavior cannot be tolerated. I might add that no community, fledgling or otherwise, is able to tolerate for too long the behavior of individual members when it corrodes the bonds of relationship and trust. Taking our varifocals off for a moment we now begin to reflect on the parable of the wedding feast and its appendix, the story of the wedding garment, from our own contemporary perspective. When we interpret this parable within the wider message that Jesus teaches concerning the expectations of the kingdoms, what kind of story do we receive? This is a story about invitation and response to invitation. Like the Hebrew Prophets who precede him, Jesus issues God’s invitation for us to return to the covenant, which God established with Abraham and has renewed again and again throughout history. So when the king a.k.a, God, finds that those he longs to invite to his banquet decline, he reissues the invitation again and again. Maybe the original invitees do or don’t accept, but over time many who initially were regarded, or may have regarded themselves as not among the invited, with joy receive and accept the invitation. You and I are the recipients of an invitation to come into covenant with God, made new through the death and resurrection of Jesus Christ. Like Matthew, we too are scribes of the Kingdom and in our interpretation of God’s invitation, the covenant with Israel has not been superseded. It has simply been extended so that it now include us. Perhaps we have not seen it that way? Perhaps we have assumed that we are not included in the invitation. Or perhaps we have taken our invitation so much for granted that we have neglected to actually accept. As we come into covenant with God, there is a clear sense that each party to the covenant bears an appropriate responsibility. When one party fails to discharge their responsibility then the covenant is rendered inoperable. Jesus is saying to us that the primary expectation for the coming of the kingdom is that we will respond to God’s invitation and take up our responsibility to collaborate with God in the Kingdom’s coming. A fruit of that acceptance is the fostering of deep and meaningful bonds between us within the context of our community (ies). It is to us as a community that God speaks, and it is from and through us working together as a community that the expectations of the Kingdom will be advanced. Perhaps we have not understood it this way? Having accepted God’s invitation to become co-creators of the Kingdom, it is important that our clothing reflects the gravity of our having been invited into covenant by God. At St Martin’s our response to God’s invitation means putting on our most festive clothes and throwing ourselves extravagantly into a celebration of our diversity, and the rich human potential of our members. We celebrate our enormous potential as a community to make a difference in one another’s lives. We celebrate with gratitude and thanksgiving the abundance of God’s generosity towards us. Through our celebration of our common life we work tirelessly to make a difference in the world around us, a world in desperate need of the celebration of the love of God. Over the coming month, the month of our Annual Renewal Campaign, how might we as a community join together in affirming our acceptance of the invitation to come in covenant relationship with God? Might we not put on our wedding garments and celebrate with true joy our God’s generous invitation to make the Kingdom real in our own time? An invitation requires an acceptance to become effective. Let’s not overlook our responsibility to respond. Might Jesus have been a Pharisee? A commentary on the Parable of the Wicked Tenants. Jesus offers three parables concerning vineyards. Two weeks ago we explored in the sermon entitled Lord, do not give us our just deserts, the parable about the hiring and payment of workers in the vineyard. The storyline of this parable presents us with an interesting twist on generosity. We are shown that the generosity of God is somewhat reckless and makes no sense to us. It is in fact, an affront to our normal expectations of fairness. It turns our sense of justice upside-down. Last week in the parable of the two sons concerning their father’s request to work in the family vineyard we explored our need to experience ourselves making a difference in the wider world. By accepting God’s call for us to enter into a collaborate participation within a parish community, we can make a difference in the world. You can read more at Making a difference. Today we receive a further parable concerning the action of wicked tenants who through murder attempt to dispossess a vineyard’s rightful owner. Of the three vineyard parables this is the most challenging and difficult for us to interpret. Jesus has just arrived in Jerusalem having journeyed from Galilee. As it remains today, Galilee was the northern most province of Jewish territory. In the 1st Century however, the population of Galilee was mixed. A largely, Jewish rural peasantry lived alongside a Greek and Roman urban commercial class. Together with the local Jewish aristocracy, the gentile commercial class owned large tracts of land, which they leased to be farmed by the Jewish tenant farmers. This constituted a traditional feudal economy. An escalation in rural unrest swept the Galilean countryside as the feudal balance of privileges and obligations between landowner and tenant farmer came under threat from the increasing commercialization of farming, necessary to meet the growing food security needs of the Roman Empire. This situation, not unknown in our own day resulted in severe exploitation of the tenant farmers, who in many cases were being reduced to landless peasant laborers. The plight of the itinerant peasant laborers is clearly at the heart of Jesus’ parable of the workers in the vineyard. The parable of the wicked tenants is a tale of the violent resistance of tenant leaseholders to a shifting economy, a shift that results in growing general unrest throughout the Galilean countryside. Having arrived in the Jerusalem Temple, Matthew shows Jesus embroiled in an escalating argument with the Temple authorities. The Jerusalem Temple was not only the center of Jewish religion, it was also an oppressive socio-economic institution that taxed and controlled the populace as a proxy of the Roman occupation. Jesus is directly challenging the corruption of religious authority through the influences of economic and social power. In the vineyard parables, and especially in the parable of the wicked tenants, Jesus is asserting his claim to represent the Kingdom authority of God. The Kingdom of God is a concept at the heart of the Oral Tradition of the Jewish prophets. This tradition rails continually against the political corruption of the Law of Moses and the exploitation of power under the guise of religious authority. Listen to another parable, Jesus says to the priests and scribes. By telling the story as a story echoing the socio-economic tensions of the time, Jesus plays on their aristocratic outrage in the face of the affront to their rightful privileges posed by resistance of the populace. In this reading the Temple Authorities see themselves as the legal landowner. Yet, Jesus’ story also contextualizes a much older story that would be known to his hearers. Jesus echoes Isaiah’s vineyard parable set as the first reading of 17th Sunday after Pentecost. The parable is a form of story telling that lures hearers into a false sense of security. It invites them to identify with the familiar elements in the storyline so as to paint themselves in the best light. Just when they are comfortable it whacks them in the side of the head with a conclusion that is so counter intuitive as to seem outrageous. Now when the owner of the vineyard comes, what will he do to those tenants? They said to him, ‘He will put those wretches to a miserable death and lease the vineyard to other tenants who will give him the produce at harvest time’. Now Jesus whacks them. Have you never read the scriptures: … when the chief priest and the Pharisees hear this … they realized that he was speaking about them. Matthew adapts the parable to speak to his own context. For Jesus, this parable, along with all the parables he tells, but especially the vineyard parables, proclaims the expectation of the Kingdom of God. The expectation of the Kingdom reveals how God sees things within the context of the in-breaking of a new divine order. For Matthew the parable becomes a story about the Christian Church. Matthew and all the Evangelists conflate the Kingdom and the Church. To this day we inherit a long tradition of seeing the Kingdom and the Church as if they are coterminous. Jesus speaks only about the Kingdom. Following Matthew’s lead, the Christian Church, conflating Kingdom and Church, has interpreted this parable as a parable of how God as the landowner has expelled the wicked Jewish tenants and given the vineyard to the new Christian tenants. God sends the prophets of Israel again and again to call the Jewish tenants to pay what they owe. Each time they kill the prophet. Finally, they kill the heir, i.e. Jesus. God punishes Israel by removing it from the tenancy. This reflects the struggle of Matthew’s small and fragile Christian community against the powerful synagogues with their Pharisee rabbis. Matthew’s treatment is understandable within his context. Yet, from the end of chapter 21 and throughout 22, Matthew ratchets up an astonishing invective against the Pharisees. 2000 years of anti-Semitism flow from Matthew’s and the other Evangelists adaptations of the teaching of Jesus to their contexts. This last week, our Jewish neighbors have been celebrating their High Holy Days, from Rosh Hashanah and Yom Kippur, the New Year. For Christians to receive this gospel with its overt anti-Semitism needs some further comment. Jesus’ argument is with the Temple Authorities, the priests and scribes of the aristocratic Sadducee party. By contrast the Pharisees represented a great religious reform movement that vehemently opposed the Jerusalem-based, Sadducee priesthood with its strangle-hold on power. There is considerable evidence to suppose that Jesus was himself, a Pharisee. Jesus sees the teaching of the Prophets, the Oral Tradition, as a complementary authority to the Law of Moses. This is also the Pharisee position. His teaching on the resurrection of the dead is a Pharisee teaching. His emphasis on the coming of the Kingdom of God is a Pharisee expectation. Even if Jesus was not actually a card carrying Pharisee, his view of the world was clearly aligned with theirs. Jesus clearly preaches and teaches within the great awakening that gives rise to the Pharisaic reform movement taking place in 1st Century Judaism. The 1st century socio-economic tensions that Jesus echos in his teachings on the Kingdom of God finally boil over into series of Jewish rebellions against the Romans in the 60’s AD. The Jewish wars culminate in the Roman destruction of Jerusalem and the Temple in 70AD. With the end of the Temple there is an end of the priesthood. With the loss of the Temple and its power structure in Jewish society the Sadducee’s fade from history. The Pharisees become the movement that reconstitutes Judaism, a new Judaism that blossoms into the rabbinic movement that gives Judaism its shape today. This process is going on along side a similar process that is leading to the emergence of the Christian Church. Each movement reflects many common elements. Within the time frame in which Matthew is writing the rabbis, who are codifying a reformed Judaism finally decide that it’s no longer judicious to tolerate the Jewish Christians within the broad tent of the synagogue. They expel the Christian Jews. Pharisaic Judaism and the young Christian Church, despite their clear similarities, now become bitter rivals. The animosity between Jew and Christian begins here in the final decade of the 1st century. This is why Matthew slips the Pharisees in as allies of the priests and the scribes in their confrontation with Jesus. Matthew does so not because they were actually Jesus’ rivals, but because they are really his rivals, with whom he and his community are in tension. This is a parable that has been traditionally interpreted as pointing to God’s repudiation of his covenant with Israel. Yet, for me it is the parable that calls us as Christians to take a long hard at our complacency. Anti-Semitism is once again on the rise. We must not blindly accept the Gospel writers contextualization of 1st and 2nd Century Jewish-Christian conflict as the justification for the perpetuation of anti-Semitism. It is currently very difficult, especially for American Jewry to distinguish between the State of Israel and the religion of Judaism. Rabbi’s tread carefully along a tightrope they are bound to fall off at some point. They will either offend conservative members who conflate Israel and Judaism, or they will offend liberal members who feel strongly that a Jewish voice must be heard in critique of Israeli treatment of the Palestinians. Christians must not participate in a rise of anti-Semitism under the guise of a critique of Israel’s treatment of the Palestinians. If it’s not possible at the moment for Jews to always keep the two separate, there is no excuse for us failing to do so. We can be surprising deaf at those times when we separate Jesus’ clear teaching on the expectations of the Kingdom of God from the mission of the Church. The Church is not the Kingdom, though its charge is to be an agent of the Kingdom. As the Church we are called to work tirelessly in the vineyard of God’s Kingdom to advance the cause of justice in this world. The Church frustrates the expectations of Kingdom when Christians fain hard of hearing, refusing to hear the radical message on social and economic justice that lies at the heart of Jesus’ teaching on the Kingdom of God. Our third sin is that of self-satisfaction and self-assertion. As Episcopalians we need to repent of our uncritical acceptance of certain social values as Christian values. The social values of the autonomous individual, strong and independent, tempt us into the sin of believing that we are the authors of our own salvation. The benefits of a secure and successful life are not the fruits of our own cleverness. They are the gifts from God for which the correct response is gratitude. Knowing our dependence on God’s reckless generosity, we take the gifts given us to enjoy, so that through self-giving and generous lives, we express our gratitude by working together to build the Kingdom God in our several generations.